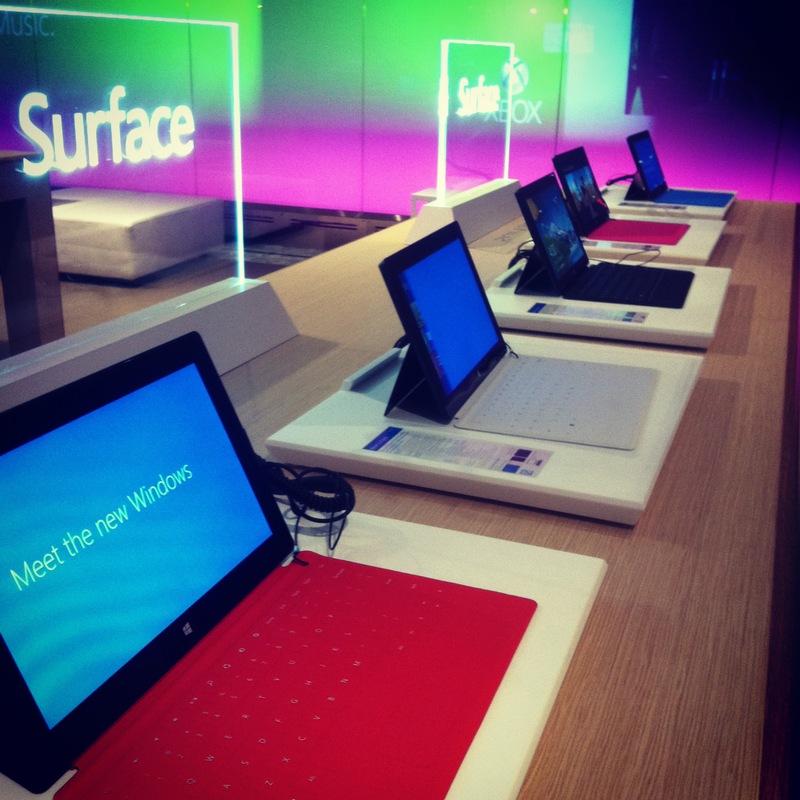 Touch-based, live tiles and information at your fingertips is what Microsoft is betting the house on with the new Windows 8 and its new tablet product, the Surface. 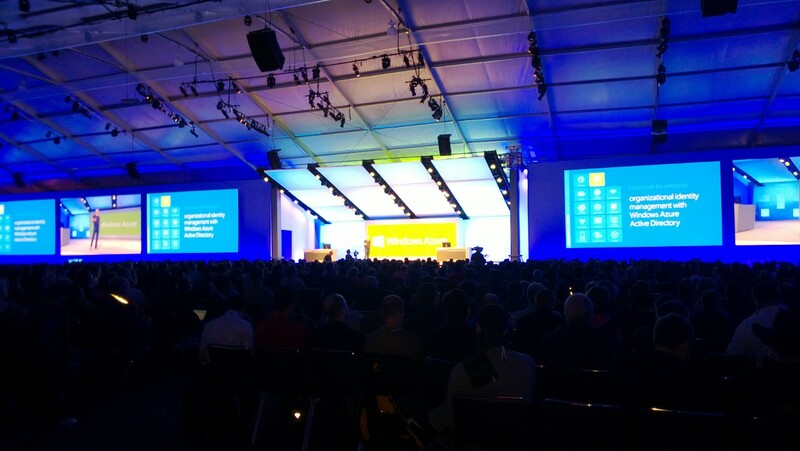 A few weeks ago I attended BUILD 2012 which is Microsoft’s 2-year-old conference that appears to have replaced two of the most successful Microsoft conferences, PDC (Professional Developer Conference) and MIX. The tickets for BUILD 2012 sold out in about 45 minutes after going on sale. This shows you how Microsoft is still very relevant in the technology industry, and continues to fight aggressively in various fronts such as game consoles, small business software, enterprise software, email, search, phone and now tablets as well. This year, BUILD was held at Microsoft’s headquarters in Redmond WA, which Microsoft’s CEO Steve Ballmer jokingly said during the keynote it was a decision they made after having one of the driest summers recorded in Redmond’s history. It was cloudy, cold and rainy every single day during the conference, but it was expected, after all it is Seattle weather. Having the conference at Redmond was something some people appreciated since it gave them the opportunity to visit the campus of one of the world’s largest tech giants. However, as large as their campus is, it is not designed to handle a conference as big as BUILD. Many of the attendees I spoke to felt that this year, they missed on the opportunity of doing more networking with the speakers and with other attendees as everybody was always in the move trying to take a shuttle to get to the next session which many times was in a different Microsoft building. BUILD 2012 attendees stayed in various hotels within a 5 mile radio from the Microsoft campus, this means that every person had to either drive or wait for a shuttle to arrive at the hotel to take them to Microsoft’s campus. Shuttles were comfortable and on time, the drivers were always friendly but the ride was boring and it felt as a waste of time to commute for about 15 minutes to get to the conference from the different hotels in the area. In most conferences you can always stay at the hotel were the conference is being held at or stay in a different hotel within walking distance. There was also the location of sessions, they were divided in two buildings, #92 and #33 and if in a single day you wanted to attend sessions that were on both buildings, then Microsoft provided shuttles between buildings… again, comfortable rides, friendly drivers but because of the commute between buildings most people felt like there were missing on talking to other attendees or actually get some work done or notes between sessions since you almost always had to be traveling from one building to another. Because of the large number of people, sometimes it took up to 45 minutes waiting in line to get onto one of these shuttles. 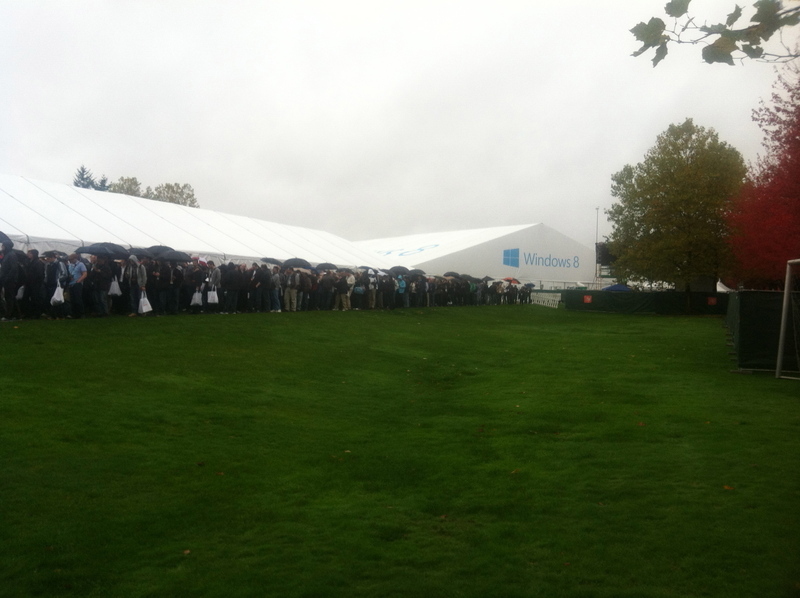 The two keynotes and beer fest were held at a huge tent setup right outside of building #33 on a baseball field. Breakfast and lunch were in a different tent that was setup next to the large one. For people who attended sessions in building #92, there was also a tent setup on a soccer field outside the building were breakfast and lunch was served. The image above should give you an idea on the lines we all had to deal with just to move from one place to the next… it was like a theme park for geeks, but without the rides. The keynote on day one was my favorite, the pre-keynote show was very interesting and I enjoyed it very much. Microsoft had Jordan Rudess – an enthusiast and pioneer in the world of alternative music controllers such as touch-screen computers, etc… play some cool music using keyboards and a new app on a Surface tablet. Jordan Rudess is the co-creator of MorphWiz and Tachyon. * Developer account only $8.00 in the next 8 days. 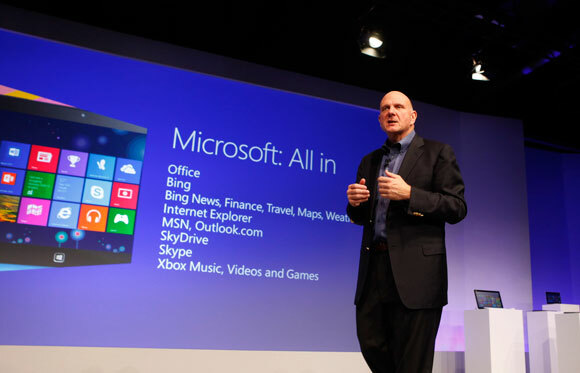 * Every conference attendee gets a new MS Surface with Windows RT, 32GB storage, a 150GB of skydive’s storage and a new NOKIA Lumia 920 Windows 8 phone. 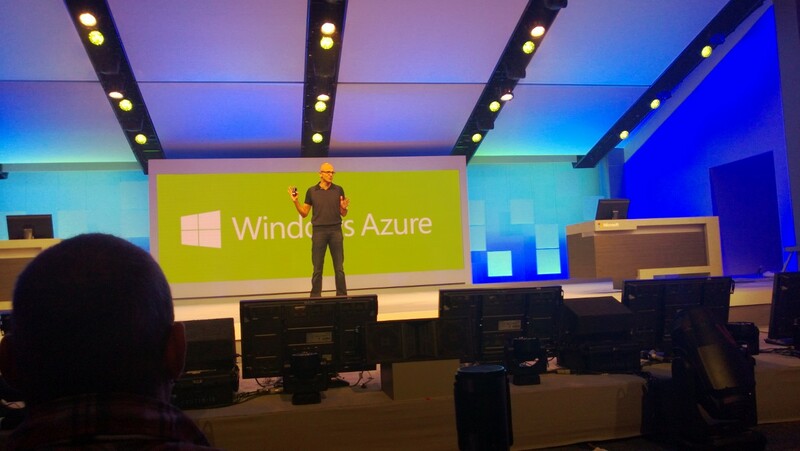 This keynote was focused on the new tools available to developers to build Microsoft Store Apps and Windows Phone Apps. As a developer I am actually excited about the possibilities, it feels as if Microsoft finally nailed it with all the things that are necessary for developers to start building apps on the Windows platform. First of all, the updates made to Visual Studio, Windows Azure and the Microsoft App store are great, things just work now and it is incredibly easier to build a basic useful app when compared to building the same app for iOS. I attempted to use Windows Azure a few years ago and was disappointed with this product, it was not mature enough yet and it definitely felt half-baked. Today, Windows Azure is extremely easy to use and Microsoft has made it really easy for developers and companies to start using it, without paying anything upfront or making any commitments to it. Take a look by yourself. Another great announcement during the keynote was the mention that registrations to Microsoft’s developer program was available at only $8.00 (an offer that will only lasted until 11/8), as opposed to $99.00 which is the regular price for one year registration, the same as Apple’s developer program fee. Many people still do not realize what a sweet deal this is for developers, especially if you also take into account that Microsoft has a 100% free version of Visual Studio as well, so you could really start developing, hosting and selling an app with just about $8 out of your pocket. I should also mention that if you are part of the BizSpark program, you can have access these tools for free. A new Windows operating system with a very cool and intuitive touch-enabled interface. Microsoft is taking a big risk with Windows 8 and that is exactly what this company needs, to bet on new things and be seen as an innovative company and not as a company always playing catch up with other companies. I like were Microsoft is going with Windows 8 and all of its tiles, as both a software developer and a consumer, I feel excited about using Windows again. I packed a Macbook Air and a Dell laptop for this trip and after receiving the Surface with Windows RT, I barely used any of the laptops during the conference, email was very easy to set up on this new tablet and browsing the web and apps was very enjoyable using the touch screen. What about taking notes during the conference? the Surface comes with the smart cover which also serves as a keyboard and it is surprisingly good when typing. It is not as easy to type on it as it is on my Macbook Air but you get used to it after some practice – to jot down thoughts and small notes the on-screen keyboard was very comfortable. The battery is also something that was surprisingly lasting, it lasted from the time I got out of the hotel around 7:30AM until about 8PM. The Surface was not used all the time of course but it was neat to realize that every time I took it out of my backpack it was ready for me to browse the web, check email, type something or use some of the new Windows 8 apps. The user interface works, touch just works, and information is always there for you, what you need and when you need it. For example, you can select the apps that appear as tiles in your desktop, change the layout as much as you want and more importantly, if your app is connected then the tiles get updated with information so you don’t even need to open the app to see new data – what does that mean you might ask? for example, I installed the New York Times app and placed it in the desktop, this app shows me the latest news as it is available in NYT.com, without me having to open the app or even open a browser to get to their website. This is truly what “information at your fingertips” was meant to be. If you are into sports you can have sport related apps show scores, or you can have an email app that shows you new messages as they come in, as well as total of unread messages, etc – without even opening the app. These app shortcuts or “Tiles” are alive and always getting the newest data when connected. Very clever and useful. Sounds too good to be true? we’ll have to wait and see, personally I think MS is right about taking a huge risk by going all in with this new OS, they are showing great support to all developers out there by lowering the cost of the developer registration, handing free software and hardware and committing to spend a lot of resources marketing Windows 8 and its applications. “You’ll see Windows 8 every time you go on the internet, every time you turn your TV, in every magazine, newspaper and on every highway”. ~ Steve Ballmer, CEO, Microsoft. 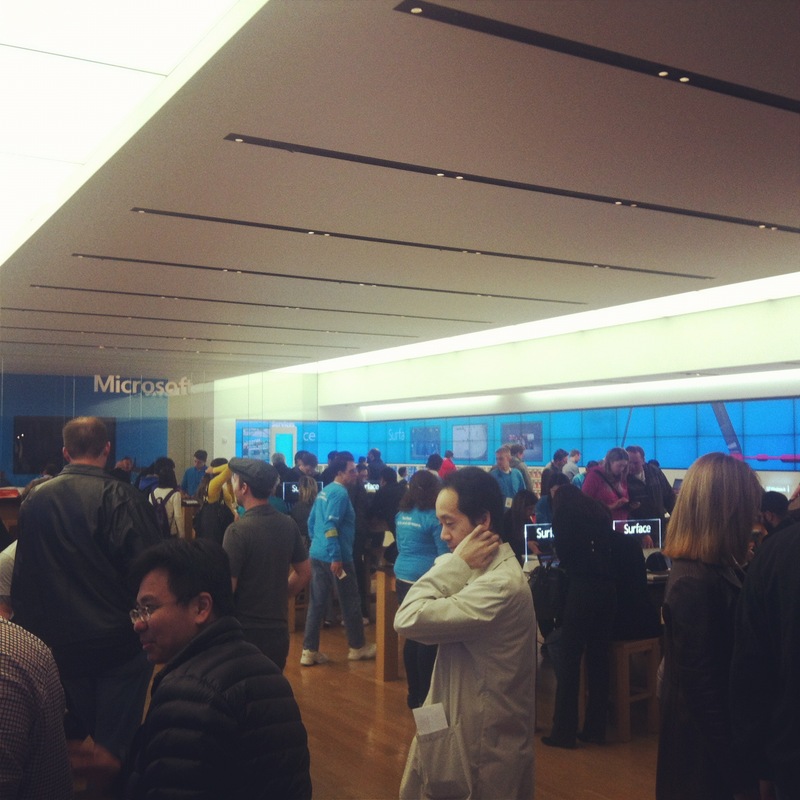 Since Microsoft opened its retail stores, this is the first time I see a Microsoft store this full of people wanting to look and play with the Surface tablet and laptops running the new Windows 8 operating system. Look at the photos and make your own conclusions. 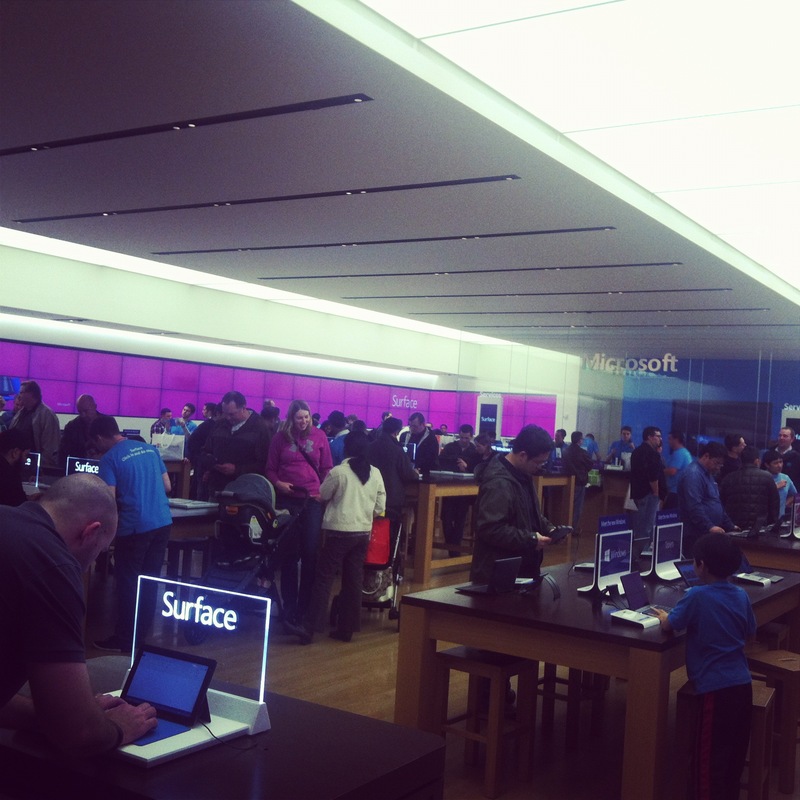 The Surface with Windows 8 is already causing people to talk about Microsoft and Windows again, many people are complaining that Windows 8 is confusing and that they don’t see a need to upgrade from Windows 7, other people say they love it and appreciate the innovative design, live tiles in the new desktop and immediate access to music, movies, news, weather, apps, games, etc… what do you think? is Microsoft cool again? 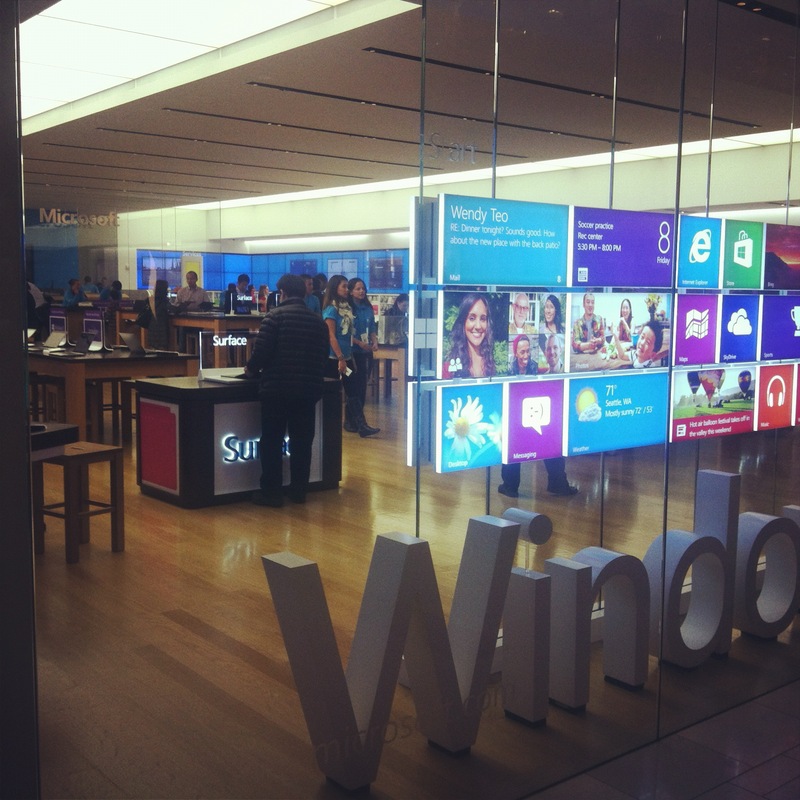 and if you are a software developer, are you interested in building Windows 8 apps?